I introduced myself and Esther, our library assistant. I asked the students if they were good at pretending, and then asked them to pretend that I was a student coming in to the library at lunchtime. To help them pretend I then put on a school jumper that I borrowed from our uniform samples. Pages with small rips in the bottom. We talked about how to turn pages carefully from the top right-hand corner. Torn pages. We talked about being very gentle turning pages. Books where the pages had become separated from the binding. I explained that sometimes books did come apart because they had been well-loved and we discussed what to do when that happened. Pages taped together with sellotape. I was hoping to avoid the actions of well-intentioned parents with this one! Water-damaged books. I asked for guesses as to what had happened to these books. We talked about keeping books away from water and food, and protecting them from rain by using their book bag. Books that had been drawn in. After making sure that no-one in their class would ever do such a horrendous thing we discussed how to keep books away from younger siblings armed with crayons. Books that had bite marks out of them. After guessing what had happened to these books we talked about keeping books safe from pets. My favourite - book vs washing machine (a strange clump in a plastic bag). After guesses as to the fate of this book we discussed keeping books in safe places and not on floor where they could be scooped up with the washing! 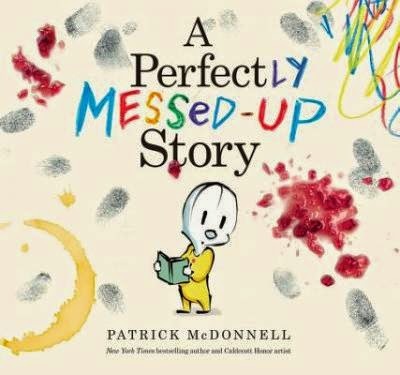 We finished by reading 'A perfectly messed-up story' by Patrick McDonnell. The book has two messages - that life can be OK even with a few 'messes', and the one I used it for, which is to treat books with respect. I cleared up the whole 'Americans call jam jelly' issue before I started reading. They were lots of fun! I thought I might be embarrassed pretending to be a student but it was easy and a good way to go through library policies and rules without being too boring. The school jumpers are very fleecy and hot! I had been worried I might frighten some students when I was loud but fortunately they all coped well with that. We had some lovely suggestions about where the bite marks on the books came from, including people, tigers, sharks and bookworms! As soon as they knew it was dogs that had bitten the books I got lots of dog stories. Children love to talk about their pets!